Shortly after Hong Kong was shut out of the Asian Film Awards – ironically, Lau served as its jury’s president – its stars took solace in the fact that the Hong Kong Film Awards were right around the corner. At least there, the once prolific local film industry could celebrate its own. In 2013, the title waving the flag for the city was “Cold War,” a co-directorial debut for Longman Leung and Sunny Luk that won nine Hong Kong Film Awards. But is “Cold War” a Best Picture masterpiece in the same league as “Infernal Affairs” (the 2003 winner that inspired Martin Scorsese’s “The Departed”), “Ip Man” (2009, revitalizing the martial arts genre and Donnie Yen’s career) or “A Simple Life” (2012, winning numerous awards at film festivals across the world, most notably Venice)? Or is it simply lauded because it was the best that Hong Kong had to offer this past year? Certainly, “Cold War” gets off to a fast start, catapulting the viewer into the opening credits by way of the organizational chart in Hong Kong’s police headquarters. On one side is Sean Lau (Aaron Kwok), who leads the management division, and on the other, Waise Lee (Tony Leung Kar-fai), head of operations. Sean and Waise report to the same commissioner and suffice it to say, there is no love lost between these two as they fight for turf, projects and recognition. Following a downtown explosion, a car crash and several police officers being taken hostage all occurring within minutes of each other, Sean learns that Waise has escalated the investigation to a “Tier 1 Response.” From then on, mayhem breaks loose within the operation and upper management as suspicion deepens. 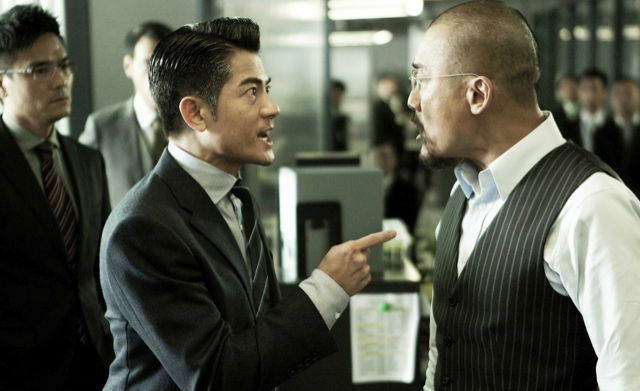 “Cold War” has drawn many comparisons to “Infernal Affairs,” but while both deal with the bureaucracy of the Hong Kong police force and the possibility that a mole is within its ranks, that is pretty much where the similarities end. “Infernal Affairs” mastered its handling of mistaken and hidden identities, carefully calculating each move as part of a complicated chessboard. “Cold War,” on the other hand, is a frenzied hunt-or-be-hunted chase which becomes increasingly confusing with the number of characters and details piling up at breakneck speed. One cannot help but think that, despite the film’s slick polish as a blockbuster action movie – slightly marred by overdone CGI effects – “Cold War” is an attempt to right Hong Kong’s identity crisis not just in Asian cinema, but in Asia, period. Repeated references to Hong Kong as “Asia’s Safest City” are scattered throughout the film, supporting Philip Luk’s statement of defiance. When Kwok and Lau (as Philip) appear in the same room during a one-on-one conversation, it’s a nostalgic throwback to the cinematic heydays when they, as two of the Four Heavenly Sky Kings (along with Leon Lai and Jacky Cheung), ruled seemingly every local production. (Incredibly, Kwok and Lau have not shared the screen since “Lee Rock III” more than 20 years ago.) When this patriotism collides with the information overload indicative of this day and age, “Cold War” at times overwhelms its viewers. As a result, it falls slightly short of the caliber of some of its fellow Best Picture winners. Still, it would be nitpicking to expect “Cold War” to surpass landmark works in Hong Kong cinema. It is better to consider it a tremendous step forward in the genre of fiercely local modern action. Most of all, the outstanding ensemble performance drives the engrossing plot, and serves as a reminder of the abundant acting talent that Hong Kong has to offer. Supporting veterans Chin Ka Lok and Gordon Lam are solid as Sean Lau’s and Waise Lee’s respective trusted right-hand men. Promising newcomers Eddie Peng as Waise Lee’s son Joe and Aarif Rahman as an independent investigator hold their own for the most part, despite looking a bit too young for their respective roles. Kwok, who has now prioritized acting over his trademark singing and dancing, turns in another impressive performance, adding to the excellent choices of roles he has made during the past three years. But it is Leung who, despite consuming less screen time than Kwok, commands the audience’s attention in his performance as the blunt and demanding Waise Lee, resulting in many well-deserved Best Actor awards and nominations during the past year. “Cold War” screens at the New York Asian Film Festival on Wed., July 10, at 8:15 p.m. at the Film Society of Lincoln Center. Tickets can be purchased at filmlinc.com.